The United States Professional Tennis Association (USPTA) Midwest Division honored those who stand out in all aspects of the tennis industry, from tennis coaches to players to volunteers during its annual Midwest Division awards breakfast Jan. 27, at the USPTA Midwest Division Conference in Lincolnshire, Ill. USPTA is the world’s oldest and largest association of tennis-teaching professionals. 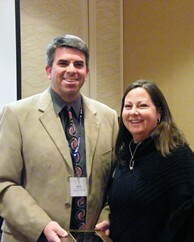 Cathy Thomas of Mason, Ohio, received the Nancy Mickler Memorial Award. This award goes to a woman who has gone above and beyond to promote tennis in the Midwest. This year’s award winner is someone that has a true passion for the sport of tennis which can be seen in all that she has done for tennis. She has been a member of the USPTA since 1985. Thomas has promoted the sport of tennis on many levels. She started a Parks and Recreation program in which children were bused in and received free tennis clinics. She also started an after school program in the Mason City School District and these programs led to running a variety of summer programs. Currently, she is the only USPTA pro to make her home at the Lindner Family Tennis Center in Mason, OH, the site of the annual Western & Southern Open. She manages an ambitious tennis schedule with adult and junior lessons, programming and tournaments. She also maintains an after school tennis program for over 60 children. Thomas is also very involved, as a volunteer, with the Western and Southern Open. She is the chairperson for two committees with the tournament. On top of these duties during the event, she is very instrumental in helping the USPTA Midwest Division host their on-court education event every year during the Division’s Mid Year Forum held during the Tournament.